GEORGE WASHINGTON (1732-1799). 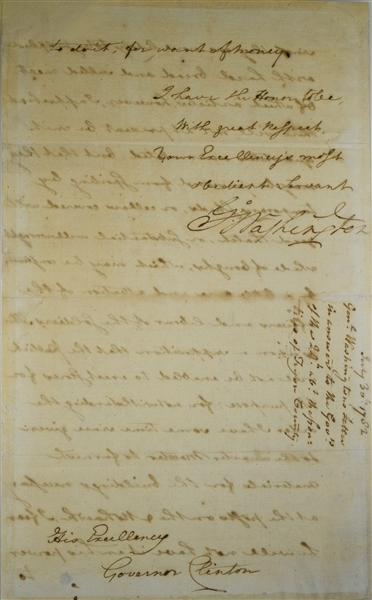 Letter Signed as Commander in Chief, to Governor George Clinton. Newburgh, N.Y., July 30, 1782. 4 pp., 7 x 11¾ in. Condition. Fine. Professionally strengthened along old folds, very slight toning, minor water discoloration in one corner, some ink show through. Between victory at Yorktown and recognition of American independence, British forces, Loyalists, and native tribes all continued raids on American outposts and settlers, especially on the New York frontier. Washington had to maintain the army’s strength in order to force favorable negotiations, but here defers to the local governor. Fortunately for both General and Governor, Colonel Marinus Willett was one of the Revolution’s most capable leaders with decades of familiarity with Western New York’s peoples, places, and potential problems. Historical Background Despite Washington’s victory over Cornwallis at the Battle of Yorktown in October 1781, the war lasted another year. The British had left Savannah, Georgia, only three weeks before Washington wrote this letter, and they still occupied Charleston, South Carolina, and New York City. Washington believed that the United States had to be robustly prepared for another campaign. Nathanael Greene, one of his most respected generals, agreed that the British would continue to prosecute the war. King George III wanted to fight on, and debates in Parliament left the option open. Even after a string of American victories had convinced the British to negotiate for peace, the British naval victory over French Admiral de Grasse at the Battle of the Saintes in the Caribbean in April 1782, gave some in Great Britain second thoughts. They questioned whether it was any longer necessary to grant full American independence. Events in London, however, overtook military operations in North America. In late March, Lord Rockingham, who was sympathetic to the American cause, replaced Lord North as Prime Minister. In early April, British envoy Richard Oswald opened formal negotiations with American commissioner Benjamin Franklin. On November 30, 1782, Britain agreed to recognize American independence and to withdraw its forces. 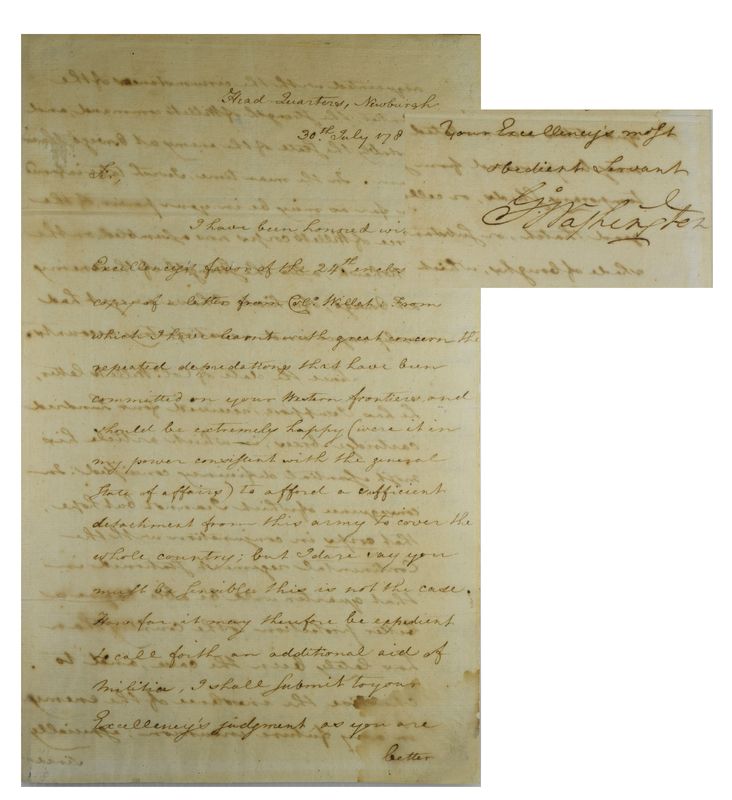 The Treaty of Paris, ending the Revolutionary War, was formally ratified by Congress on April 11, 1783. By the end of that year, the last British troops had evacuated New York City. On July 17, 1782, Colonel Marinus Willett wrote from Fort Rensselaer on the Mohawk River to New York Governor Clinton that an enemy force of 500 or 600 had burned all uninhabited places between Herkimer and Little Falls on the Mohawk River and driven off 150 head of cattle and 50 horses. Willett complained that he could not pursue them without “salt provisions and hard bread,” which he did not have. His lack of weapons and clothing prevented him from utilizing a “considerable proportion” of the troops raised by promises of land bounties. 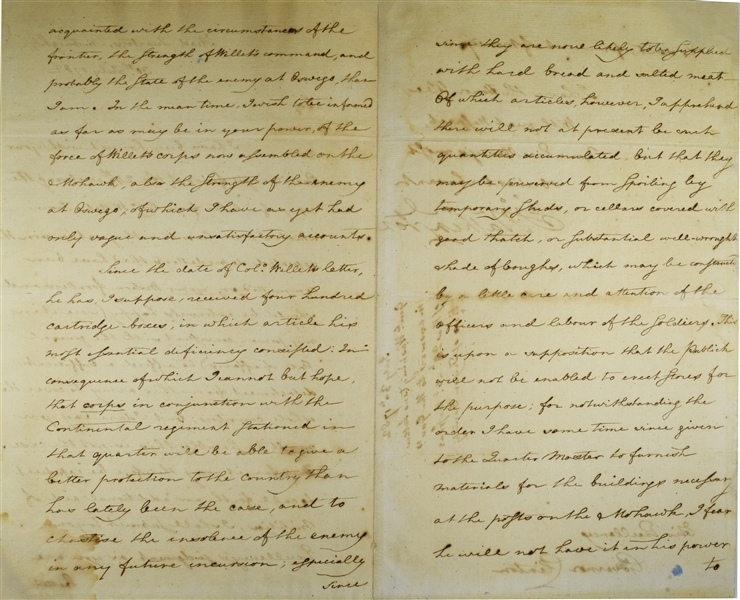 On July 24, Governor Clinton forwarded Willett’s letter to General Washington with his concern that unless Willett’s command were augmented and properly supplied, “the whole of the Settlements on the Mohawk River will be destroyed or abandoned.” He offered to call into service more militia to reinforce Willett. He also reported that the troops along the Mohawk River lacked the necessary buildings to store hard bread and salted meat. 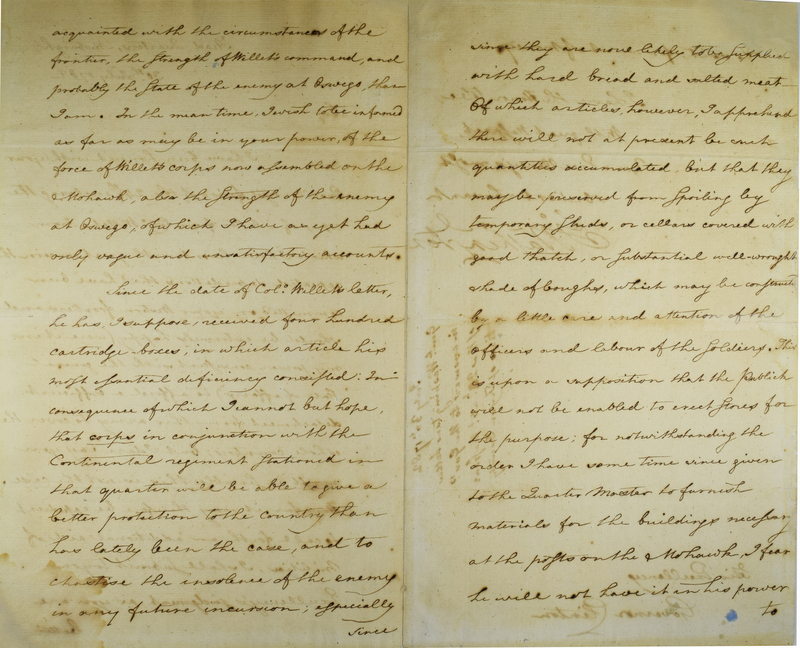 (Full text of Clinton and Willett letters) Washington was in the unenviable position of trying to maintain the strength of his forces to keep a favorable negotiating position, while also protecting American settlers over a wide frontier. The Commander-in-Chief had much to do and few resources, so he was happy to defer to New York Governor George Clinton regarding troop strength and reconnaissance in the Empire State. 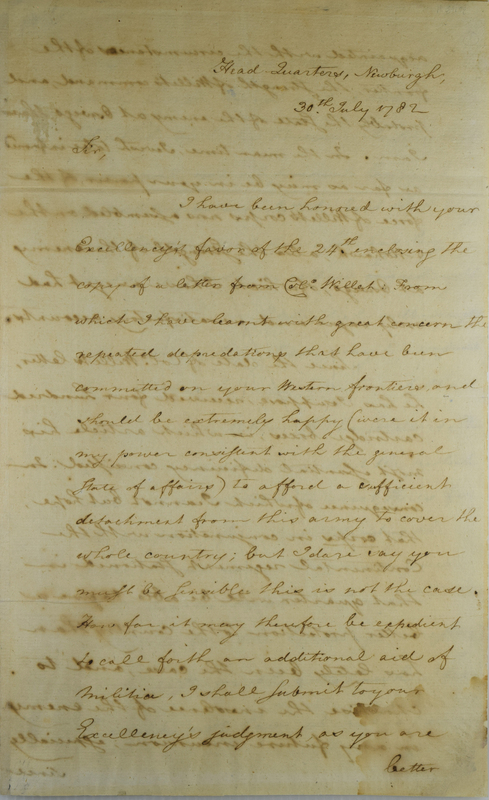 In this letter from his headquarters in Newburgh, New York, Washington explains the discrepancy between his desires and his abilities to the governor up the river in Albany. George Clinton (1739-1812) served as the first governor of the State of New York from 1777 to 1795, and again from 1801 to 1804. He served as Vice President to both President Thomas Jefferson and President James Madison (1805-1812). Born to Irish parents in the colony of New York, he served in the French and Indian War first on a privateer in the Caribbean and then in the militia. After studying law, he began his practice in 1764, and also served in the New York Provincial Assembly from 1768 to 1776. Commissioned as brigadier general in both the militia and the Continental Army, Clinton began serving as New York’s governor in July 1777. Colonel Marinus Willett (1740-1830) was intimately familiar with the geography and geopolitics of the Western New York frontier. He was characterized by historian Mark M. Boatner as “one of the truly outstanding American leaders of the Revolution.” Willett served in the militia during the French and Indian War and had taken part in the expedition to Fort Ticonderoga. He participated in the Battle of Fort Frontenac, and later convalesced at Fort Stanwix. As a New York Son of Liberty, he helped confiscate arms from an arsenal and captured British stores at Turtle Bay in the East River. Willett was appointed captain in the Continental Army, again heading north and participating in the Invasion of Canada and the Siege of Quebec. After a series of posts throughout New York, in April 1781 he was made a colonel of the New York militia and assigned to the Mohawk Valley. Most of his efforts involved fighting local Loyalists and their Indian allies, notably at the Battles of Sharon Springs (July 10, 1781) and Johnstown (October 25, 1781). 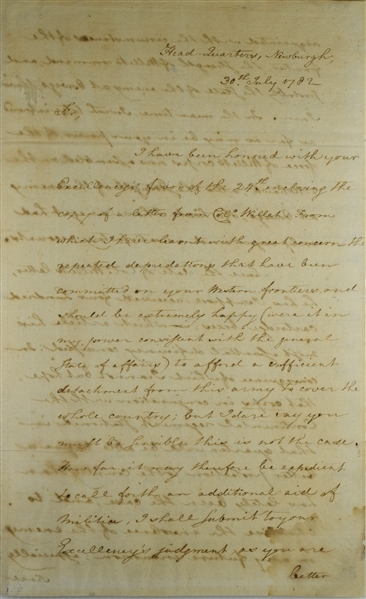 Willett was still in the Mohawk Valley when Washington wrote to Clinton asking him to keep an eye on the British forces that had recently rebuilt Fort Ontario. In February 1783, Washington instructed Willett to take Fort Ontario back from the British, but Willett retreated upon determining that he had lost the element of surprise. The fort would remain in British hands until 1796, after the signing of Jay’s Treaty. Willett maintained his political alignment with Governor Clinton and later served in the New York State Assembly, Sheriff of New York County, and the 48th Mayor of New York City.